Webmasters is an evening-length work, which premiered at Mead Theatre Lab and simultaneously at Dance Digital in Essex, England in March 2011. Director and Choreographer Adrienne Clancy looks at relationships as reflections in this new performance piece. Via Internet connections, dancers in two distinct locations are often paired with one another, both in physical and virtual space via image projection. Multiple layers of reality exist in each moment. 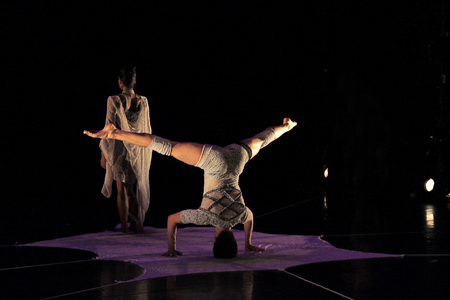 Clancy’s choreography builds upon Spider Grand Mother emergence tales and asks: how do we maneuver in another’s web, and what happens when we traverse through our own labyrinth of gossamer paths?